Maybe you can win back your office bracket entry fee at one of the two online casinos featured in this post. While they do not have a basketball-themed slot, try SHOCKWAVE — which is exactly what the UMBC Retrievers sent through the tournament with their dominating performance over top-seeded Virgina Cavaliers, winning by 20 points. They came into the game 20.5-point underdogs and viewed as hardly a threat to a team that went 31-2 during the season. Captain Shockwave Video Slot offers maximum wins up to 30,000 coins across a staggering 50 paylines – with up to 20 free spins with 4 X multiplier adding some muscle to the player experience. 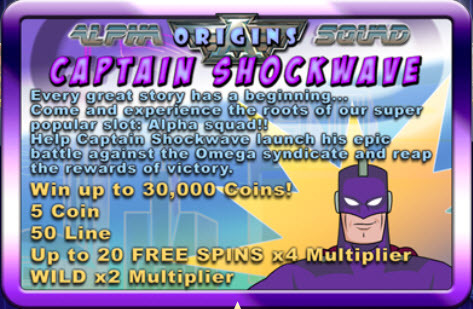 Also be on the lookout for Captain Shockwave’s “sonic boom” symbol as that is a wild symbol carrying a 2 X multiplier bonus, while free spins is activated by three or more “Sonar the Dog” symbols. Yes, I know that Chinese New Year 2018 was on February 18. I’m a little behind in posting all of the online casino promotions that are being offered as part of the celebration. While many online casino promotions around the Chinese New Year have expired, the good folks at Mandarin Palace Casino still have their promotion available to all players — and it’s a nice one, too! This game takes you on a Samurai quest for honor and survival. Based on the Japanese/Samurai theme, this game is focusing on a 14th century story of two Samurai hunters stalking a magical red crowned crane. Presented in a contemporary cartoon style, this online slot machine is a rich blend of the old and the new. It is a fusion of rich historical and contemporary Japanese visuals. To see how the game plays, here’s a 3 minute video demo that I made of TANZAKURA. If you like what you see at and would like to make a deposit at Mandarin Palace Casino, they are offering a nice 288% Match up to $576! This offer expires on the 1 August 2018. TANZAKURA is a new online slot machine at Grand Eagle online casino, where that will give you 40 FREE SPINS to try it out and win actual cash. If you like what you see at and would like to make a deposit at Grand Eagle online casino, they are offering a nice 300% first deposit bonus up to $600! What have you got to lose? Head over to Grand Eagle online casino and claim your TANZAKURA free spins — maybe you’ll hit a big win! All offers are available for 1 claim per IP at Grand Eagle. This offer expires on the 22 May 2018. I have an exclusive bonus code for you, worth 40 free spins on one of the newest online slot machines at Lucky Creek Casino. If you like this game and would like to join Lucky Creek Casino, I have another exclusive bonus code, worth up to $600. This dark video slot, that comes out of the well-respected line up of Saucify, global gaming software providers, is bound to send shivers’ down your spine with it’s eerie story line that will ensnare and captivate. Central to the game is the character of Mrs. Green, an old lady who owns and runs a peculiar flower shop. Unlike other flower shops that are bright and cheerful with lots of happy faces, Mrs Green is happy to never part with her plants because they hold a dark and twisted secret. The plants in this game are wild and carnivorous but when it comes to entertainment value and a powerhouse of rewards, this slot doesn’t beat around the bush when it comes to providing layers of intrigue. If you “plant the right seeds” at Mrs. Green’s Plant Emporium, the harvest you will reap will be nothing short of abundant. This slot with 3D animated symbols will capture the attention of those looking for a fast-paced and enchanting gaming experience. One of the most valuable symbols in the game is Mrs. Green which serves as the triple high Wild symbol, substituting for any of the other symbols except the Scatter symbol, represented by the game logo. Win up to 50,820 Coins on a single spin! Terms and conditions apply to the bonus codes. All offers are available for 1 claim per IP at Lucky Creek. Here’s a great offer for both new and existing Treasure Mile Casino players. I’ve been dealing with the Genesys Group for several years. I’ve written about them several times on this blog and have referred many players to their online casinos. These guys are legit. I’ve not had one complaint from any of the players that I have referred to them. 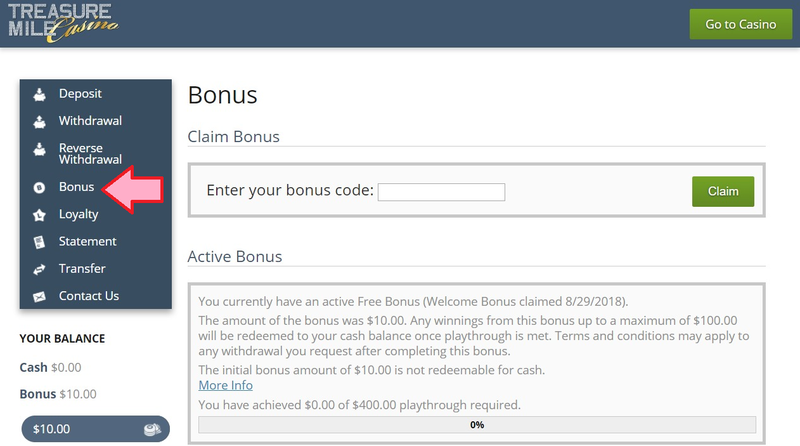 When I myself have conducted testing of their online casinos, I was able to easily deposit with my credit card, claim bonuses, and cashout without issue. The games are above average, and their chat agents are knowledgeable, helpful, and do not give you any kind of runaround when asking about cashout methods, timelines, and fees. One of the top benefits to playing at a Genesys Group online casino is that they process your cashout back to the credit card that you used to deposit. This is very rare for an online casino to be able to do this. And it’s wildly convenient. As of this writing, Genesys Group operates five online casinos: I’ve listed them below. My personal favorite is Treasure Mile because it supports both mobile and desktop platforms. You can find full-page reviews for each of these sites linked from this page on The Online Casino Gambling Directory.